Raghava (Upendra) is a fun-loving youngster who enjoys playing cricket with his friends. But at night he is afraid of ghosts and is always confined to his home under the care of his mother (Umashri). His brother (Achyuth Rao), sister-in-law (Shruti) and their children live together in the same house. When Raghava and his friends go in search of another ground to play cricket, they find an abandoned field, which, it turns out, is haunted. At home, his mother and sister-in-law witness some strange happenings. With the help of a temple priest, they confirm the presence of a ghostly spirit haunting their home. Raghava begins to act funny and shows effeminate behaviour which is when the presence of the ghost is identified. 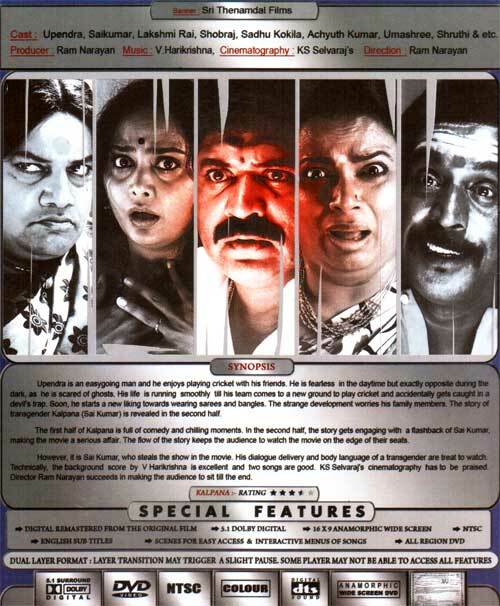 The film goes on to unravel the mystery of the ghostly Kalpana (Sai Kumar) and her relationship with Raghava.